Disclaimer! 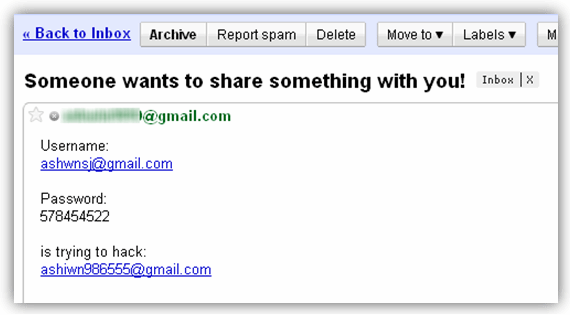 : The purpose of this post is to demonstrate how the Gmail hacker can use tracking software to hack your account. We just want you to be aware of this and we do not encourage you in any manner to try it on others. 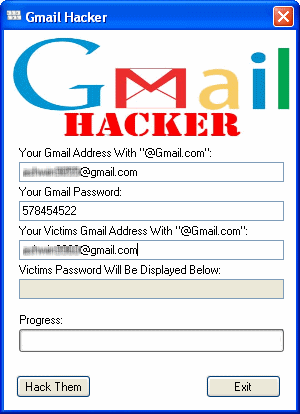 This is the Simplest way a hacker can use to hack your Gmail password, However, this may not work for some people because most Antivirus software easily recognizes this “Gmail hacker software” as a virus by inspecting the way it is coded. This trick involves creating a special executable file and sending it to the Victim. and when he or she runs this ‘ hacking software‘ the hacker will get the Username and Password to his “Inbox”. Basically here, the hacker just tricks his victim to enter his login credentials by luring him to hack his friends Gmail account. This demonstration requires you to have ‘Microsoft’s .net Framework‘. If you don’t have this framework, please download and install it first. Step 1: Download ‘Gmail hacker Software’ from here and extract the file to the desktop. If your Antivirus deletes the file, then please turn off your Antivirus or uninstall it and try downloading again. 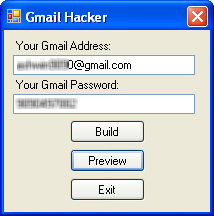 Step 2: Run ‘Gmail hacker Bulder.exe’ file and enter your Gmail account details, so that the password of your virtual-victim can be mailed to you. If you are afraid of entering your email details, do create one fake account and enter those details. Step 3: After you enter your ‘Gmail account‘ details click on ‘Build’. Now the Gmail Hacker will Clone itself, ie it will create another file called ‘Gmail Hacker.exe’ and will save it in the same folder. Step 4: Now Send this clone ‘Gmail Hacker.exe’ file that you just created to your victim via chat or email. you could just take this on different PC to try. Ask your victim to try that software to hack others email and somehow convince him to run that software and enter all the information (which includes his Gmail id and password plus Gmail ID of the victim he wants to hack). When he enters the required information and hits the ‘hack them’ Button, he will receive an error message as shown below and his Username and Password will be mailed to your email id that you specified in Step 2. Note: You should Provide a valid USERNAME and PASSWORD in step 1, in order to receive the hacked details. Publishing Malicious Chrome Extensions in the “Chrome Web Store” just got Harder!